It’s still well before dawn, and the crew of the Nisei sit quietly in their skiff, killing time. Bowed by the weight of the tide, 150 feet of fine-gauge net stretches from the stern to shore, its end tended by a crewman on the jetty. Another 150 feet is still stashed in the deep belly of the skiff and serves as a lounge for the crew there. Now and then, the captain, Hiroshige Uehara, nervously shines a flashlight on the water to see how the catch is going. The rest of the crew, mostly Okinawans like the captain, pull the hoods of their slickers over their heads against the drizzle. We’re waiting for the nehu to come in. These tiny fish are the last commercial fishery on Kaneohe Bay. They school in great numbers there, and, for generations, aku boats have come to catch them for bait. Aku fishermen need millions of nehu. Instead of dragging nets like bottom fishermen, or using baited hooks like longliners, traditional aku fishermen hook skipjack using long poles and barbless hooks. To get the fish to bite, they chum the waters with swarms of live bait. Without the nehu of Kaneohe Bay, the old way of aku fishing would die. But the old way is a hard one. Once, dozens of aku boats set their nets in these shallows; the pier at Heeia Kea Boat Harbor was homeport for more than 20 of them. Now, only two aku boats are left: the Nisei and the old wood sampan, Kula Kai. Like many fishermen, the Okinawan crew of the Nisei are a taciturn bunch. Although they’ve worked in Hawaii for decades, they speak English haltingly and are shy to use it. David Soto, the Nisei’s engineer, the only local in the crew, acts as a spokesman. He points out that the crew is experienced. 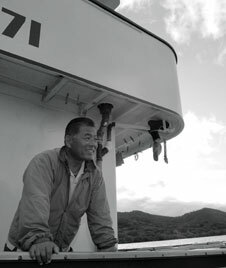 “The youngest man on this boat is 52,” he says, “and that’s me.” He jokes about working with Okinawans, but he’s been with the Nisei since it was launched 13 years ago, following Uehara from his previous boat. Most of the crew have fished together for years. Soto makes an excellent guide. Out in the skiff, the only noise is the soft baritone of Soto’s voice as he explains nehu fishing to me. Then, the captain shines his light on the net one last time and nods to the crew. He turns to me and smiles. “Plenty fish,” he says. It takes all hands to pull in a haul of nehu. We start by heading to the jetty to collect the crewman there, veering the rest of the net as we go. Once the circle of the net is closed, the captain kills the engine again, and Soto pulls on a scuba tank and slips overboard. He’s the penner; underwater, he uses his body to pen the edges of the net up against the side of the skiff so none of the fish can escape through the gap there. At the stern, the captain paces the haul, pulling in the head rope of the net float by float. Eisho, the captain’s brother, stands behind him, helping haul on the head rope, pausing every so often to organize the long net as it comes into the boat. In the center of the skiff, the brothers Hiromasa and Tetsushi Tamashiro grab for the belly of the net, shaking the nehu back into the water as they pull. They’re helped by Quentin Gohier, an old Hawaiian man from the Heeia docks who sometimes volunteers for these nehu runs. Slowly, the pile of net under their feet grows as the circle diminishes. The nehu seethe inside. There are millions of them—so many that the weight of them begins to sink the net. Silvery swarms flush over the tops of the floats. Many more leap over the net to open water. Outside the net, schools of papio stir up the surface in a frenzy over the escaping baitfish. To keep the net from sinking, the crew stick the ends of stout bamboo poles under the float rope, cantilevering the net over the gunwale. The weight of the nehu bends the poles. When most of the net is aboard, the crew pull in the foot rope, which closes the bottom of the net, making a bag of fish about the same size as the 26-foot skiff. Soto surfaces out of the roiling turmoil of nehu and scampers back aboard. There are eight live bait wells built into the aft deck of the Nisei. Each is about 10 feet deep by six feet wide. Sometimes, it takes two or three days’ work to fill them. This haul, though, is astonishing. The skiff pulls alongside the Nisei, penning the net between the two boats, and some of the crew jump aboard. Once on deck, they hand down large stainless steel buckets one by one, and the crew in the skiff use dip nets to fill them with bait. Then, the buckets are handed back aboard and emptied into the bait wells. Now and then, a crewman reaches into the seething net to grab an akule or a papio that’s been accidentally caught with the nehu and flings it back out into the Bay. The nehu are bounty enough. The waters of Kaneohe Bay used to provide a livelihood for many of those who lived along its shores. Dozens of fishponds once fattened moi and mullet. At low tide, limu pickers waded in the shallows. Fishermen poked in the holes of the fringing reef for hee and lobster. They plied their nets across the tide for akule, aweoweo and amaama. On old maps, you can still see the names of shore-side families jutting out into the bay as if their kuleana stretched to the bounty of the reef. But the fisheries of Kaneohe Bay have collapsed. Pollution and overfishing and silting have taken the profit out of fishing, and the Nisei and the Kula Kai are the only commercial boats that still venture into the bay. Tour boats dominate the commerce of the bay. Most sail from the pier in Heeia Kea, where a ragtag fleet of catamarans and trimarans shuttle tourists out to the reefs. Although most of these boats have a utilitarian look, there’s a surprising charm to them. Some of them have spindly masts and booms, meant to give the impression they’re Polynesian sailing canoes. Others have had their spars removed, and they seem to squat on the water. But all of them are motorboats, and are slab-sided, garishly painted and ungainly. Nevertheless, when they’re nosed up to the sandbar on a sunny morning or moored haphazardly along the fringing reef in the dark just before a storm, or tied at the docks in the glassy waters of a Kona breeze, they still convey a sense of nostalgia for old times, and are beautiful. Five companies operate commercial boats at Heeia, but the two largest, KBOS and Tropical Ocean Sports, account for most of the tourist trade. Between them, they manage more than a dozen vessels and employ nearly 50 people, including captains, mates, deckhands, tour guides, dive masters and hostesses. In all, the tour boats of the bay provide the livelihood for perhaps 100 men and women. Among the tour boats, the Coral Queen, a plywood, glass-bottom trimaran, is the oldest. It has been ferrying passengers out to the reefs for more than 35 years. Today, the Coral Queen belongs to Tropical Ocean Sports. With a bright blue paint job, it matches the company’s larger boats. Unlike those others, though, the Coral Queen doesn’t cater to the tourist trade. Mike Nolan, the main captain of the Coral Queen, says, “Most of our business is local. We do a lot of preschool groups like UH Labs and Kamaaina Kids. We do a lot of ‘Make a Wish,’ too.” Over the years, thousands of Hawaii’s children have gotten their first glimpse of Kaneohe Bay’s reefs through the stout glass boxes in her main cabin. Nolan has worked on many of the tour boats in Hawaii, and has spent most of the last 15 years on the bay. One of the biggest changes he’s seen has been in the way the state regulates the tour boats. In the old days, tour operators ran Jet-Skis and ski boats and dive platforms willy-nilly on the bay. But residents complained, and now, the Department of Land and Natural Resources restricts each tour operator to discrete zones called Ocean Recreation Management Areas, or ORMAs. “Some companies,” Nolan explains, “offer highly active tours, like Jet-Skis and banana boats.” These companies have to buy permits for their own ORMA. Other operations offer snorkeling or kayaks, but no motorized rides. These companies have their own ORMAs too, and much of the bay is divided into territories by tour boat companies. The Coral Queen is the only glass-bottom boat on the Bay. It harkens back to an old tradition: The Coral Gardens, another glass-bottom boat, was the first tour boat on Kaneohe Bay. In the early 1900s, it took passengers out to ogle the reefs off Mokapu—reefs since dredged to make the runways for the Marine base. This bit of nostalgia, along with a kind of squat charm, made the Coral Queen attractive to me, so one afternoon, I joined in as it took a group from a Manoa elementary school out for a cruise. The Coral Queen normally operates with a crew of three. On this day, Ty Fu, the young relief captain, is at the helm. Marvin Engoing, a large, doughy man with a wispy beard and a ponytail, is the crew. Rhonda Stewart, an enthusiastic woman who’s worked on the boat for many years, is the education director and is in charge of the children. Once the teachers have the school group hustled below, Engoing slips the dock lines and Fu quietly spins the Coral Queen off the pier and heads out into the bay. Stewart begins to regale the children with stories about the natural history of Kaneohe Bay. There’s a broad shelf at the forward end of the pilot house where an ad hoc nature center has accumulated: the shells of three different kinds of conch; a cowrie shell; a desiccated slipper lobster; an assortment of corals; the splayed shells of pearl oysters; corroded and coral-encrusted 50-mm bullet casings; the jaw of a hammerhead shark. In the main cabin, six glass-bottom boxes stand like cabinetry. The children peer through them, watching the coral rubble sweep past as we motor off. Once we reach the reef patches off Coconut Island, Fu kills the engine and lets the boat drift slowly in six or seven feet of water. While the children crowd around the viewing boxes in the main cabin and marvel at the coral below, up on deck Engoing breaks up loaves of stale bread to throw over the side. Schools of yellow tang and striped angelfish swarm to the chum, drawing oohs and ahs from the children. Then Engoing, as the newest member of the crew, prepares a surprise. “Good thing I brought towel,” he says. “I gotta swim under the boat.” Stewart keeps the kids distracted below while he dons a mask and slips quietly overboard. There’s a burst of laughter from the children as he drifts into view under the Coral Queen. Floating past on his back, he waves to them, his ponytail undulating like limu. For many of these children, this is their first time on a boat. “Despite being an island state,” Stewart says, “Hawaii has the lowest incidence of boat ownership in the country.” It speaks to a lost relationship—a sad lack of connection between the students and the sea that surrounds them. Passing Coconut Island on the way back to the dock, Stewart gets the teachers to lead the children in the Gilligan’s Island theme song. The teachers sing enthusiastically. None of the children seem to know the words. The Makani Olu is a 96-foot, three-masted, staysail schooner. Like all schooners, it takes a rat’s nest of lines to manage the sails. When the Holopono program takes groups of kids to sea, they have to literally learn the ropes. They go on five-day, round-trip cruises to the Neighbor Islands, where they usually also participate in community projects. At sea, the kids work the ship, standing watches and taking turns at the helm. Even so, it takes a professional crew of five to sail the Makani Olu: a captain, a mate and three hands—surely the last professional sailors on the bay. The pilot house contains a mini natural history museum for young students to explore. After a recent charter trip for an Elderhostel group, I volunteered to help move the boat from Aloha Tower back to the bay. The crew is new, and I’m eager to see them at work. When I arrive at the dock, I find a full complement of five crewmen aboard. Jon Michienzi, the captain, sailed with the Makani Olu several years ago. He and the first mate, Ben Hopkins, have recently arrived from the tall ship Amistad. The other crewmen also seem to be experienced. But my main impression is how young they all are. Even so, we pull away from the dock without incident and set out to sea. Michienzi predicts a six-hour passage. The trip turns out to be more boisterous than expected. The trades gather strength as we leave Honolulu Harbor, and by the time we make Koko Head, they’re blowing hard on the nose. Even motor-sailing, our progress is slow. At first, the ride is exhilarating. But we have to tack far out into the Molokai Channel, and the swells build and become confused. Many of the passengers become seasick. In the cabin, loose gear flies from one side to the other. The young crew becomes more subdued as the passage turns into real work. This is sailing in Hawaii. Even after we finally round Makapuu and begin the downhill run along the windward coast, everyone is obviously looking forward to the end of the trip. Darkness sets in as we reach Kaneohe Bay. The trip from Honolulu Harbor was a long slog, but most of the real work is still ahead. In the failing light, we wrestle down the sails, furl them on their booms and get their covers on them. By the time we reach the Makani Olu’s mooring, we need the spotlight to find the buoy. The wind is still strong and it takes several passes before the crew manages to grab the mooring line with the boathook—only to find the lines are tangled and we blow off again. Finally, a couple crewmen launch the ship’s tender and manage to untangle the lines and get one aboard. The Makani Olu is moored. In the end, the passage from Aloha Tower takes 12 hours. After shuttling ashore in the inflatable with the other passengers, I stand in the shallows and watch Hopkins head back through the dark to the Makani Olu. No doubt, the captain wants to discuss the mooring troubles with the crew. But I’m struck once again with the miracle that, against all odds, young people still go to sea. The idea makes me smile. Boats and the wind and snarled lines will always give sailors trouble. But, if an old schooner like the Makani Olu can still make a go of it, perhaps there’s still hope for those who make a living on Kaneohe Bay. Freelance writer Dennis Hollier grew up in Enchanted Lake. His last piece for HONOLULU, in our July issue, was on a downtown barber school.